Spacious renovated cottage located on the desirable South Shore of Crystal Lake – where the family friendly speed limit is always a ‘snail’s pace’ and bicycles have the right of way. Perfect place for a large family get-together. 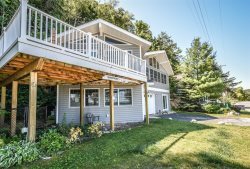 The open-floor layout with its extremely large kitchen equipped with new major appliances – comfortably sleeps up to 12 while providing gorgeous panoramic views of the lake from its wrap around deck, all overlooking the 85’ of private sandy beach directly across the road from the cottage. Large 1st floor Master bedroom, multiple elegantly renovated marble bathrooms with walk-in showers, beautiful hardwood floors, new stone fireplace, and most importantly 85 feet of private sandy beach on Crystal Lake including dock and floating swim raft. Huge front wrap around deck perfect for outdoor dining or cocktails during the majestic sunsets over the lake. The cottage is very conveniently located just minutes from downtown Frankfort and Beulah for main street shopping, excellent restaurants, Movie Theater, churches, and catching Lake Michigan sunsets at nearby Point Betsie Lighthouse. Rent bikes for the day and travel the Betsie Valley Trails, visit nearby wineries, or explore the Frankfort Marina Fishing Charters – home to world famous salmon fishing. Living Area: Perfect for the large vacationing family –the Open 1st floor layout allows for everyone to constantly enjoy the beautiful panoramic views of lake whether in the spacious updated Kitchen, large open Dining area, or relaxing in the comfortable living room complete w/ a new large stone fireplace. A wrap around waterside deck perfect for cocktails at sunset & outdoor family dining! 1st Floor includes the large master bedroom and spacious master bathroom w/ tub, perfect for the older guests wanting to avoid stairs. Upper level of cottage offers three generous size bedrooms with sleeping for 10 and two brand new marble bathrooms complete with walk-in showers. Giant upstairs bedroom overlooking lake includes a private balcony that provides amazing views of the lake. With plenty of windows, enjoy the fresh breeze during the day and fall asleep to the sound of gentle crashing waves at night. ♦ This cottage does not have a phone, however cell phone service is reliable. ♦ Waterside Wrap-Around Deck – Perfect for Outdoor Dining and Panoramic views of the lake! Fantastic girls week in a comfortable, spacious cottage on South Shore Drive. Loved every minute from sunrises over beautiful Crystal Lake, meals and games at the table, cocktails on the deck to evening fires in the fireplace. Wonderful memories! I did not make the reservations, but we did receive some misinformation during our rental that was disappointing. fortunately, it did not affect our stay. I apologize that you were misinformed. Anytime that happens please reach out to our office so we can remedy it. We are always more than happy to do so. Happy to hear that you were able to enjoy your stay! Did not have to contact staff. So helpful and very friendly! Fabulous week with my children, good friend, and grandchildren! The team was always friendly and helpful when I called. I wish we were still there! Danielle and Angie were great to work with! They were professional, friendly and accessible. We felt right at home during our stay! The cottage was beautiful and well appointed. Everyone had a wonderful and memorable time! The staff at Crystal Vacation Rental could not be more helpful and accommodating. They respond immediately to questions, always send confirming emails and let you relax knowing everything will be taken care of during your vacation. A beautiful cottage on the best road in Benzie County, South Shore. Quiet, friendly atmosphere. Plenty of room and equipment for our large family. Spotless (and I'm a clean freak.) Hope to be coming here for years and years. I liked the woman who handled our rental arrangements. She was very polite. Checking in and checking out could not be easier. We loved visiting the "Crystal Republic". We enjoyed everything about our stay (except the cleaning up and leaving part). Waking up every day to the lake view was amazing. I am currently working on trying to get my family to return in the fall or winter. Great week at Crystal Lake Relaxing and beautiful!